Or 6 payments of $79.17 What's this? The Wave Jacket Style BCD is ideal for divers, especially newer divers, who don't want a lot of bells and whistles to get in their way while at depth and for dive students who need simplicity and ruggedness in one so they can focus on their dive education. The Sleek-Design of the Wave ensures the diver will not experience a lot of drag while in the water; it also allows for a Comfortable Fit, due to its Adjustable Straps and Back Traction Pad If you're looking to supply your next dive class' BCDs, look no further than the Aqualung Wave. Not only is this BCD Safe, it is Rugged and will meet the diver's needs. The exterior is crafted out of 1000-D Armor-Shield Condura, which means the Wave can take the bumps and bruising dive gear has to endure and will look good in the process. The Aqualung Wave BCD has Torso Adjustable Shoulder Straps, an Adjustable Sternum Strap and Waist Strap with Cummerbund. All Straps are equipped with Squeeze-Style" Side-Release Buckles for Easy Donning and Doffing. Two Large Utility Pockets are Easy-to-Access and will hold all your goodies. The Wave BCD comes equipped with Aqua Lungs Power Line Inflator with an Increased Fill Rate which is now, one of the Highest Air Flows in the Industry. The Power Line is an Environmentally Sealed Unit for less maintenance, has Integrated-Hose Clips for attachment to the included 3/8" Threaded LP Hose for a Streamline and Low Profile. The Inflator is equipped with a Cable Activated Rapid Exhaust at the top, simply Pull-Down on Lower Unit to Dump Air. There is a Right Shoulder Over-Pressure Relief Valve with a Bright Orange Pull-Handle for Trimming Buoyancy. BCD also has a Patent-Pending Octopus Pocket for Easy-Access in an Out-of-Air-Emergency. For additional Accessory Attachment the Aqusalung Wave BCD comes standard with 2-Stainless Steel D-Rings. Due to the Minimalist Design of the Wave, it is the perfect Travel BCD. The Wave BCD provides from 18lbs to 44lbs (8.16kg to 20kg) of Lift depending on the BCD's Size. 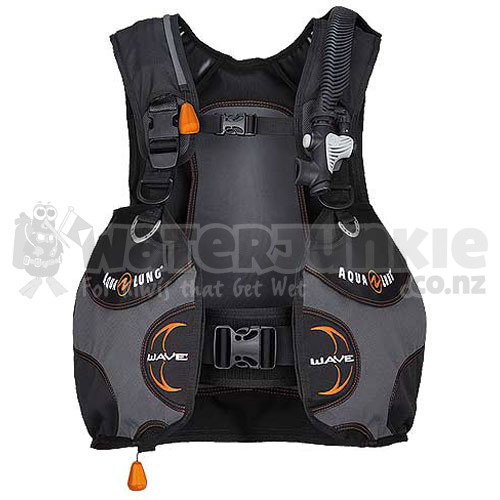 The Wave BCD comes with an Owner's Manual and is covered by a Limited Lifetime Warranty. Height 5'0"-5'6" 5'3"-5'7" 5'5"-5'10" 5'10"-6'0" 5'9"-6'3" 6'2"-6'5"